Encoders, whether rotary or linear, absolute or incremental, typically use one of two measuring principles—optical or magnetic. 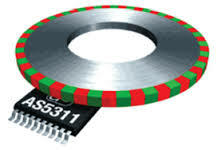 While optical encoders were, in the past, the primary choice for high resolution applications, improvements in magnetic encoder technology now allow them to achieve resolutions down to one micron, competing with optical technology in many applications. Magnetic technology is also, in many ways, more robust than optical technology, making magnetic encoders a popular choice in industrial environments. Magnetic rotary encoders rely on three main components: a disk, sensors, and a conditioning circuit. The disk is magnetized, with a number of poles around its circumference. Sensors detect the change in magnetic field as the disk rotates and convert this information to a sine wave. The sensors can be Hall effect devices, which sense a change in voltage, or magnetoresistive devices, which sense a change in magnetic field. The conditioning circuit multiples, divides, or interpolates the signal to produce the desired output. Both effects occur for time-invariant fields and may be used to construct zero-speed sensors. However, as Honeywell affirms in , MR is roughly 100 times more sensitive than the Hall-effect in silicon. Another advantage when replacing Hall-effectwithMR sensors in applications that count revolutions usingring magnets isthat theresolution doubles since MR sensors are omnipolar (operates with North or South pole). Although, Hall-effect has advantages as it is highly linear with no saturation effects out to extremely high fields. The resolution of a magnetic rotary encoder is determined by the number of magnetic poles around the disk and by the number of sensors. Incremental encoders (whether magnetic or optical) use quadrature output and can employ X1, X2, or X4 encoding to further increase resolution. The primary difference between incremental and absolute encoders, regardless of sensing technology, is that absolute versions assign a unique binary code, or word, to each measuring position. This allows them to track the encoder’s exact position, even if power is discontinued. The operation of linear magnetic encoders is analogous to their rotary counterparts, except that they use a linear scale (also referred to as a tape, since they typically have an adhesive backing) and a read head. The read head can employ either a Hall effect or a magnetoresistive sensor, and detects signals generated by the magnetic code on the scale to provide position information. For absolute linear magnetic encoders, each position on the scale represents a unique binary word, indicating the exact linear position of the read head. For incremental versions, one or more reference marks are included on the scale, to enable homing after a power-off situation. Linear magnetic scales can be provided in very long lengths—up to 100 meters from some manufacturers. The most significant advantage of magnetic encoders may be their robustness. Unlike optical encoders, magnetic versions are insensitive to contaminants such as dust, dirt, liquids, and grease, as well as to shocks and vibrations. Similar to optical encoders, magnetic encoders do require an air gap between the magnetic disk and the sensor. However, the air gap in a magnetic encoder does not need to be clean and transparent, as it does for an optical encoder. As long as no ferrous material is present between the disc and the sensor, the magnetic pulses will be detected. Two important specifications for proper operation of magnetic encoders are the radial placement of the sensor in respect to the disk (or tape), and the gap distance between the sensor and the magnet. Reblogged this on Cognitive Dissonance. Dexter Manipulator manufactured by Oxford Technologies Ltd.
ABB robot with a closed loop. Robotics & Mechatronics explanatory diagram including the involved areas such as: mechanical design, electronics, control systems and artificial intelligence.